Mobile devices are everywhere. Businesses depend on them. Customers interact with them like never before. Their exponential growth is creating high demand and an even higher need for advanced functionality. But innovation and increased speed to market bring many testing challenges like diverse hardware. Complex operating systems. Numerous carriers. Creating problem-free applications can be tedious and expensive for businesses. Mobile Application Testing for most companies is still in its infancy and most do not have well-defined methodologies or business strategies to meet their needs. Shortened test cycles combined with rapid development creates huge limitations. The lack of support and expertise for testing, as well as the lack of usability guidelines and standards means most business face huge quality assurance risks when they go to market. 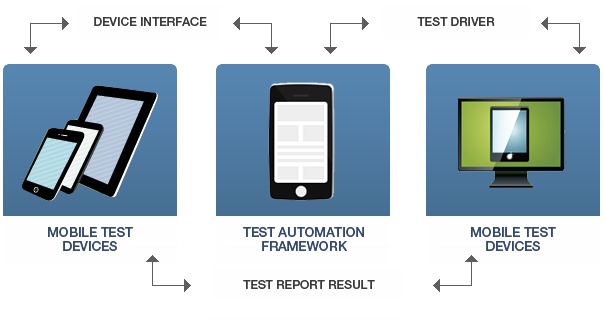 Test Automation: Automation Accelerator Framework supported for Android, iOS, Blackberry and Windows Mobile Platforms utilizing traditional Test Automation tools like HP QTP and QC while providing ROI driven frameworks for commercial solutions like See Test, Jamo Solutions, Perfecto Mobile, ZAP fix, Eggplant, et al. Mobile Cloud Testing : Setting up a private cloud test infrastructure and cloud-based testing of Applications on various Mobile Platforms and Devices using professional services like SeeTest Cloud, Perfecto Mobile, Device Anywhere, etc.